An Anti-Burst Design. A No Slip Grip. Supports 2,000 lbs. Now that's not your ordinary Exercise Ball. Do you want growth? Is enjoying your workouts as important to you as your results? Are you ready to take your training to the next level? If so, then the new Expansive Living Exercise Ball was built for you. therapists agree an exercise ball is an essential tool for your workouts. of developing diabetes, depression, and stroke. Just 1 hour of sitting is equal to smoking two cigarettes. Replacing your chair with an exercise ball helps alleviate this by increasing your blood circulation, core strength, and proper posture. We gave our Professional Grade Exercise Ball a Static Weight Test of 2,000 lbs. And our ball kept on bouncing. It's built with a 2,000 Micrometer thickness and can support a static weight of 2,000 lbs. That's four times the strength. Four times the growth. LATEX-FREE and free of any harmful phthalates. Giving you that added protection. Why settle for less? Go Ahead, Make The Decision. We offer a 100% Customer Satisfaction Guarantee. If you're not happy, we're not satisfied. It's time to Grow Beyond Your Limits.  GET RID OF YOUR OFFICE CHAIR. ★ Tired of those aches and pains of continually sitting at your desk. Replacing your chair with our Office Sitting Ball helps improve your posture and decompresses your spine. The continual Micro-Movements of sitting on one will also help increase your circulation, helping you to feel more energized and productive. You'll FEEL GREAT as you WORK HARD on the job.  GROW INTO YOUR BEST SELF. 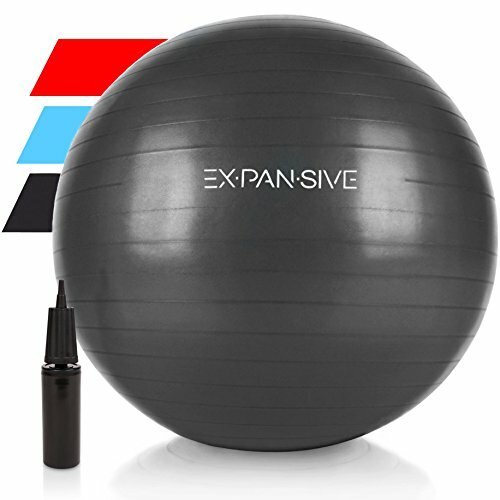 ★ With the Expansive Living Fitness Ball you can get a low impact, yet rigorous, full body workout. It will help you grow stronger and be more present, while also enhancing your balance and core strength. Whether you practice Yoga, Pilates, Judo, or CrossFit, adding one to your Home Gym will take your workouts to the NEXT LEVEL. It's Time To Grow Into Your Best Self. ★ 100% SATISFACTION GUARANTEE. ★ If You're Not Happy, We're Not Satisfied. At Expansive Living, we dream of a world where all people can grow into their best, authentic, limitless selves. And we constructed one of the TOUGHEST, HIGHEST QUALITY Anti Burst Exercise Balls to help you as you Grow Beyond Your Limits. If you have any questions about this product by Expansive Living, contact us by completing and submitting the form below. If you are looking for a specif part number, please include it with your message.